Katie Thiroux — Laguna Beach Live! Katie Thiroux is a bassist and vocalist of outstanding talent and determination born and raised in Los Angeles. Hailing from a musical family, Thiroux was surrounded by music and enjoyed it as her sole extracurricular activity beginning with violin lessons at age 4 then switching to the bass at age 8. She began singing like most kids in the church choir and gravitated towards jazz music in middle school, studying jazz voice with Tierney Sutton at the age of 12. Katie also embraced the opportunities to study with Nancy King, Kristin Korb, and met her current mentor, John Clayton, at the 2005 Vail Jazz Foundation Workshop. In high school, Thiroux participated in the Grammy Foundation jazz ensembles for all four years, was a Level I vocal winner of the National Foundation for the Advancement of the Arts, and the 2005 winner of the distinguished Shelly Manne New Talent Award. While in her last semester at Berklee College of Music, to which she was awarded the Presidential Scholarship, Miss Thiroux received an invitation to join the faculty at the Berklee satellite school, University de San Francisco in Quito, Ecuador for one year. In August 2009, Thiroux began teaching over 30 bass and vocal students. Thiroux received her Master’s Degree in Jazz Studies at Bob Cole Conservatory of Music(CSULB) in May of 2012 and is currently pursuing her career as a leader and sideman. Inspired by the invigorating styles of Oscar Peterson, Ray Brown and Anita O’Day, Katie’s acrobatic vocals and brilliant instrumental arrangements make her a rising force in today’s scene. With her trio, she travels, performs and conducts clinics for audiences and students alike because she feels that jazz education is necessary in keeping jazz alive and heard. 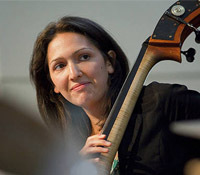 Katie has performed with the likes of Dr. Billy Taylor, Branford Marsalis, Terri Lyne Carrington.